Case Study: San Francisco Presidio deployed ERTEC E-Fence™ Wildlife Exclusion Fence at Mountain Lake in San Francisco to contain and direct the Western pond turtle and Pacific chorus frog Case Study: San Francisco Presidio deployed ERTEC E-Fence™ Wildlife Exclusion Fence at Mountain Lake in San Francisco to contain and direct the Western pond turtle and Pacific chorus frog after a lake restoration project. Download Case Study in PDF form. Mountain Lake is located at the southern boundary of the San Francisco Presidio. The Lake area and bordering national park offer a contiguous multiple-use recreational area. Its surrounding natural environment provide potential plant and wildlife habitat, attracting many waterfowl and migratory bird species. In addition to problems associated with its location in the urban landscape, the management of Mountain Lake is further complicated due to the various jurisdictions of its borders: city park, state highway, national park, and private golf course. Mountain Lake had experienced a severe degradation of its environment related to these diverse boundaries. Mountain Lake and its surrounding area is currently undergoing a long and comprehensive restoration process. It has been dredged and cleansed of sediments and toxic chemicals that have poisoned it for a century. Non-native fish and vegetation have been removed. The Lake’s natural vegetation has been restored to provide new wildlife habitat. Conservationists have reintroduced native species like Western pond turtles and Pacific chorus frogs. Native to Mountain Lake, the Western pond turtle (WPT) and Pacific chorus frog (PCF) were reintroduced. Given all the hazards surrounding the area and with an eye towards protecting the new populations, conservationists hoped to contain them in certain areas and direct them to other areas. A permanent barrier that could function in different ways in different locations was needed. The Western pond turtle is a threatened species and to minimize losses, it was decided to contain it within certain areas of the very fragmented habitat. It was desired to allow it to move between its breeding area and upland habitat and back again via ground level corridors. The adjacent areas are hazardous so it was important to keep it off the adjoining road, public access areas and the golf course. Since the WPT cannot climb, a simple short 15” high barrier, trenched 5” and installed around all areas would be needed. To tie together fragmented habitat, and allow WPT to move to its upland habitat and return to its breeding area a series of directional corridors were installed. The Pacific chorus frog, not a special-status species, is also native to Mountain Lake. It was decided that it be allowed migrate away from its breeding area in any direction except towards the adjacent roadway (CA HWY 1). At two inches long, fully grown, PCF is unable to jump over the E-Fence WPT barrier, but as an adept climber, it easily can climb over and able to reach all areas. The portion of E-Fence installed along HWY 1 therefore needed a climbing barrier. ERTEC E-Fence™ is a highly reliable and low-cost species exclusion and control barrier designed for projects in habitat where threatened small vertebrates are present. The fence is designed to exclude small vertebrate species from active construction areas, control movement within fragmented habitat and for survey perimeter control. E-Fence allows high wind and heavy stormwater flow-through. It can be installed across contours (up and down hills) without enduring the destructive and scouring effects of stormwater runoff. It is non-toxic and environmentally safe. Even after extensive exposure to sunlight, harsh weather and salt water it continues to perform. E-Fence provides very high reliability (up-time) which significantly reduces maintenance and monitoring costs. E-Fence can be used for temporary or permanent requirements. It is a ZERO Waste solution, made from recycled materials. Particularly important in this project is E-Fence’s ability to pass heavy stormwater flows. The lowest point in the watershed is Mountain Lake. All flows move towards the lake. A critical design factor for the containment fencing was to allow flows, and not introduce points of water accumulation, ponding, or unnatural flow diversions which often cause unwanted erosion and sediment movement. NASLR - National Association of State Land Reclamationists' Spring 2017 Newsletter highlights ERTEC S-FenceTM in an article about Innovation. Used very successfully for many years by t NASLR - National Association of State Land Reclamationists' Spring 2017 Newsletter highlights ERTEC S-FenceTM in an article about Innovation. Used very successfully for many years by the Colorado Division of Reclamation Mining & Safety in its land reclamation efforts, NASLR takes an opportunity to spread the news to other states. The current best practice is to use traditional silt fence to keep sediment from moving off-site. Unfortunately, it is common to see silt fence topple in the wind, break down in UV light or allow ponding and undercutting during storms. Mine Reclamation projects often last 18 months or more and it is typical for a large percentage of the silt fence installation to require comprehensive maintenance or even complete replacement more than once. Estimators often overlook the cost of silt fence maintenance, removal and waste handling. Proper installation, removal and disposal is costly. On multiphase projects, it is also desirable to relocate and reuse the BMP as reclamation activities progress, rather than dispose and start a new phase with new materials. The National Association of State Land Reclamationists (NASLR) was formed to promote the use of research, innovative technology, and professional development to foster superior restoration of land and waters affected by mining. Activities such as material logistics, equipment cleaning, processing or other operations that occur at mining locations are often exposed to stormwater. The runoff from these areas may discharge pollutants directly into nearby waterbodies or indirectly via storm sewer systems, thereby degrading water quality. In 1990, the US Environmental Protection Agency (EPA) developed permitting regulations under the National Pollutant Discharge Elimination System (NPDES) to control these stormwater discharges. Pollution Control Measures such as site specific best management practices (BMPs) must be identified in a Storm Water Pollution Prevention Plan (SWPPP) and implemented on site with regular maintenance and inspections to assure NPDES compliance. The Colorado Department of Mining, Safety and Reclamation (DRMS) is actively reclaiming and stabilizing many of its sites using many different BMPs. 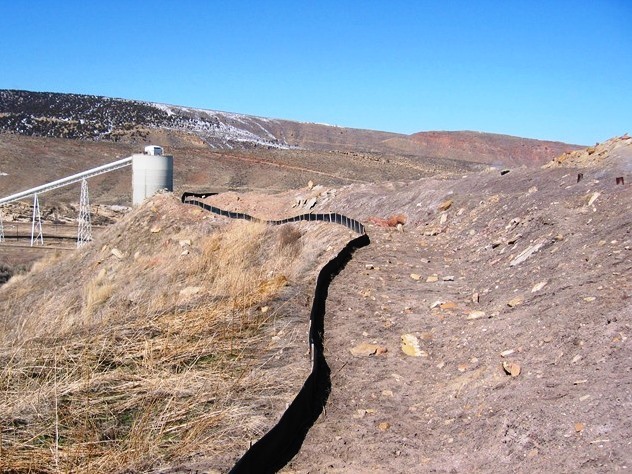 Several years ago, DRMS began using a new technology for protecting site perimeters and stabilizing slopes rather than continuing to use traditional silt fence. ERTEC’s S-Fence™ is a silt fence substitute which enhances their program in several ways. S-Fence has significant functional longevity, very low maintenance requirements, higher sediment capture performance, low total cost, reusable and zero waste. DRMS likes the way it resists UV exposure, snow loads, high winds and high stormwater flows which would normally destroy silt fence quickly at high altitudes and harsh environments. Traditional perimeter or slope protection BMPs rapidly degrade from UV or are degraded by animals. Since 2012, DRMS deployed thousands of feet of ERTEC S-Fence throughout the Colorado Rockies on many projects. During that period, DRMS often reclaimed S-Fence, once revegetation occurred, to redeploy on new projects. S-Fence will continue to perform for years. Many operating mines also take advantage of ERTEC’s S-Fence™. Light weight and easily deployed, mine technicians like to work with it. Most importantly, there is virtually no maintenance in most cases, even on multi-year projects. Some of the largest operating surface mines rotate S-Fence through several locations over many years. S-Fence™ is made from HDPE, is 100% recyclable and is 100% American Made. Case Study: Clark Construction deploys Hard Surface Guard at the Long Beach Courthouse construction project. Hard Surface Guard: Is a BMP designed to seal to hard surfaces to keep deb Case Study: Clark Construction deploys Hard Surface Guard at the Long Beach Courthouse construction project. Is a BMP designed to seal to hard surfaces to keep debris, soil or other particulates from moving off-site. Clark Construction initially installed fiber rolls around the construction perimeter in an attempt to keep sediment and debris from flowing off the site during rain storms. This didn’t work. It’s common for water to flow underneath wattles on hard surfaces. Not only did fiber rolls need frequent maintenance, they cannot adequately seal to the asphalt surface. Hard Surface Guard was anchored with masonry nails, and set up against the Site Perimeter Fence. Solids in rainwater run-off to the street and eventually to the storm drain were significantly reduced.